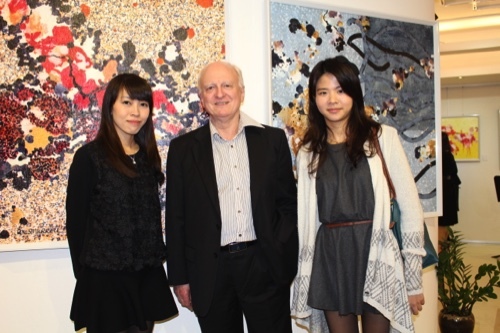 Australian artist Denis Murrell is convinced that Macau has “a lot of untapped [artistic] talent”. However, the city is currently lacking studio spaces for young artists to develop their skills. Rental prices, he recalled, have increased at such a rapid pace that aspiring artists face hurdles when trying to find a suitable place to paint. Based in Macau since 1989, Denis Murrell has been teaching some of his students a self-developed technique that combines the use of acrylic paint and absorbent tissue. Some of his works, along with those of his students, are now on display at the Rui Cunha Foundation. The exhibition, entitled “Starting Point: Denis Murrell and His Young Artists’ Paintings,” will be on display until January 31. “We have a group of people who have just started painting for enjoyment and have so far managed to do this very well. They can become artists, but they need to keep painting. And that’s the main problem in Macau: there are no longer places for painting because of rentals,” he stressed. Mr Murrell revealed that rental prices have increased to such an extent where “nobody can afford to get a studio, even as a group.” He added that a while ago, a group of artists would collaborate and pay for a space in an industrial building. However, now that owners of old factories have realized the surge in demand for such places, rental prices have gone up. “Owners suddenly realized that artists were looking for empty factories. Prices went up and now they have no one renting them,” he added. The exhibition at Rui Cunha Foundation combines artworks by Denis Murrell and several of his students, some who were enrolled in painting workshops he conducted at the Macau Museum of Art. Helen Leong, one of his students, said she had always been intrigued by his technique, and therefore enrolled at the Macau Museum of Art workshops as soon as the opportunity arose. The freedom such a technique permits was what attracted her. “I knew Denis for many years and I knew he had a special painting technique. It was easy for me because this technique is very free, I didn’t have to think about what I wanted it to become, we can do anything we want,” she said. Candice Chi Lok, one of Murrell’s English language students, said this is the first time she has attempted painting. “I think it’s quite easy for beginners, because I had no previous experience and still managed to learn the technique,” she said. Dennis Murrell concluded by saying that this is “a very unusual exhibition” due to the limited opportunities available for students and teachers to display their work together.